In the process of delivering training to the sports sector, it became apparent to us that there was a general lack of awareness of the issues that transgender people face in sports. Feedback from training also told us that whilst issues around sexual orientation in sport were becoming better understood and participants were gaining confidence, the same could not be said for gender identity or gender reassignment. It became clear that the same learning was emerging from equalities research being conducted by sportscotland and the Equality and Human Rights Commission, which was published in January 2016. 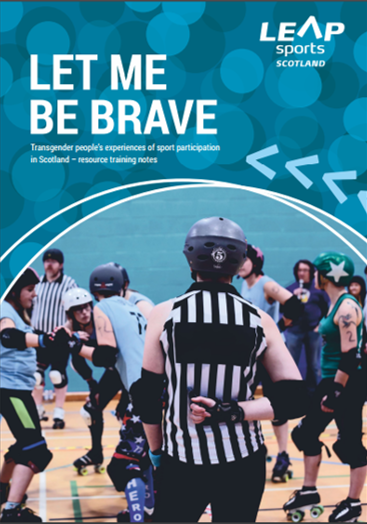 We got some partners together to look at these issues and the result was the making of a 10 minute film, Let Me Be Brave, by LEAP Sports Scotland, showing transgender people’s experiences of taking part in sport and the importance of sport in their lives. To help you use the resource, we have taken some of the key points from the film and created a small companion booklet which contains some key focus questions, allowing you to explore the issues in more depth. Click the image below to access this booklet. The questions are mainly reflective, and the answers to these will differ between sports and clubs. With thanks to Asten Holmes-Elliott for making the film, to Scottish Transgender Alliance for support and advice, and to sportscotland and Awards for All Scotland for funding the film. If you would like to talk about further training or support in relation to these issues, please get in touch with us at info@leapsports.org. We use the terms 'trans' and 'transgender' as umbrella terms to indicate the wide diversity of people who experience their gender identity and/or gender expression as differing from the gender they were originally assigned at birth.